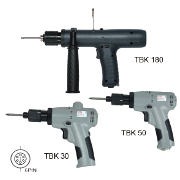 Brushless Power Torque DC-Type Automatic Screwdriver SKD-TBK series. Whole series use brushless motor, no carbon pollution and low noise motor operation. It is the best fit for assemblng power torque products. SKD-TBK series torque range can reach up to 0.3~18 N.m.
SKD-TBK series must be equipped with side handle, which canincrease stable torque output, torque precision and easier for user to operate. Highly mobility, easy to operate, stable torque, high efficiency, eco-friendly.